After 'this might help' there is just blank space and the Retry button. Pressing retry just does a small animation and the error is back again. Looking at the windows update I can see that package KB3119142 has failed (although it was successfully installed several times). I've seen on the internet that this update causes issues and I've tried the suggestions on how to fix it (by going to Programs & Features and repairing the installation). But still it did not help. Trying several various online solutions with various restarts of services, deleting some files etc. 2016.02.08 22:08:41.6928950 104   8992  Agent           Criteria = ( IsInstalled = 0 and IsHidden = 0 )""
2016.02.08 22:08:41.6943437 104   8992  Misc            Got 9482F4B4-E343-43B6-B170-9A65BC822C77 redir SecondaryServiceAuth URL: 7971f918-a847-4430-9279-4a52d1efe18d""
2016.02.08 22:08:41.6994860 104   8992  Misc            Got 7971F918-A847-4430-9279-4A52D1EFE18D redir Client/Server URL: https://fe2.update.microsoft.com/v6/ClientWebService/client.asmx""
2016.02.08 22:08:42.9943524 104   8992  WebServices     Auto proxy settings for this web service call. 2016.02.08 22:09:35.1743632 104   3556  Shared          UpdateNetworkState Ipv6, cNetworkInterfaces = 2. From the log I would say that there are quite a few updates to be installed. But no information why it is failing. The event logs are all normal, there are no error or warnings of any kind. 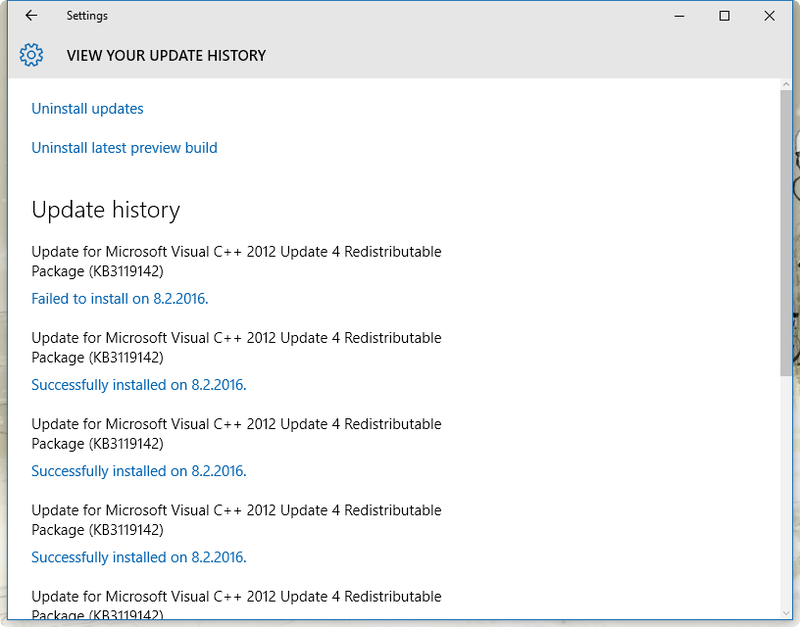 The best solution for Windows 10 updates is using a 3rd party software to install and hide updates. It installs nothing, it is portable, it allows you to hide any update including drivers. 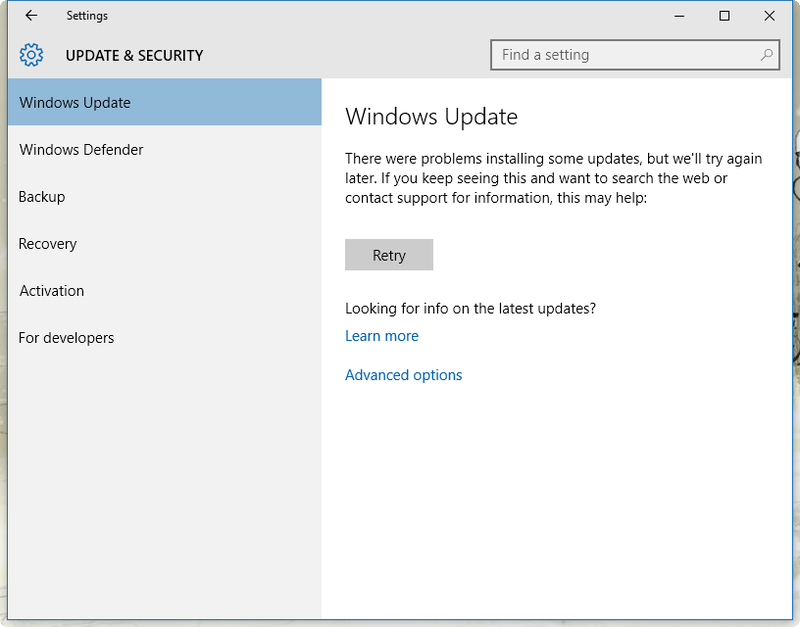 This Software makes no changes to the normal windows update or your system (except for the updates you allow it to install) but does use the Windows update service, once you have hidden your updates and installed others you want, be sure to go into Windows Services and stop the Windows update service and then set it to disabled, or it will install the updates you hid using the other software. 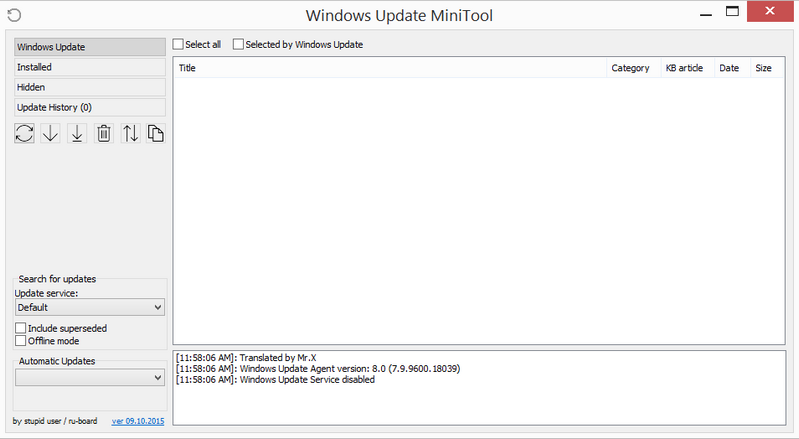 So keep the windows update service disabled, the minitool will start it automatically when you run it, then disable it again when done using the minitool. 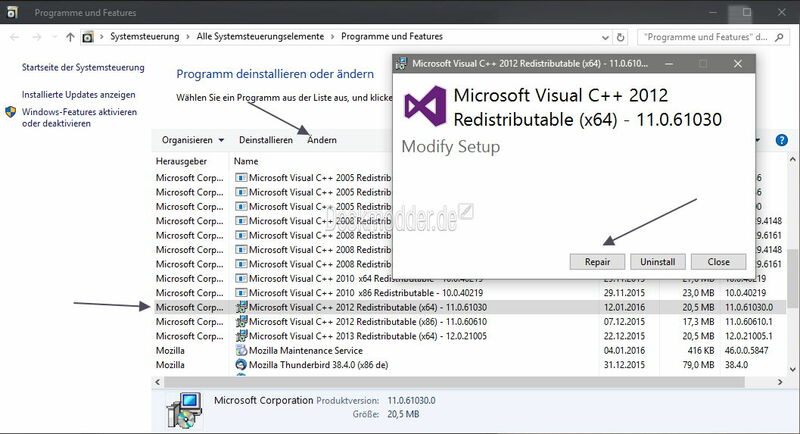 Open (Desktop) Control Panel, go to Programs & Features, select the VC++ 2012 Runtime entries, click on Modifiy and select repair. After this install the VC++ Update again and should work. I think I found an answer so I am posting it here so that it might help some other pool soul who got trapped by the hideous and ugly monster that is Windows 10. 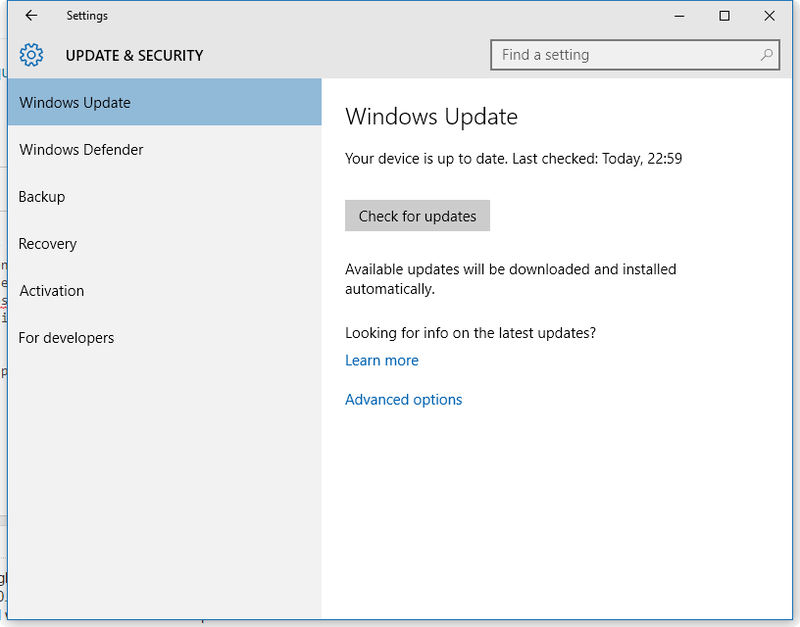 Although everyone claims it is not possible to control Windows Update there is a Microsoft tool which can be used to disable updates called 'Show or hide updates'. The tool can be found here: https://support.microsoft.com/en-us/kb/3073930 The tool is meant to be used to prevent installation of faulty drivers and it seems that this is what is happening on my side. I ran the tool and disabled the HP driver for my printer and the update now says that my device is up to date. 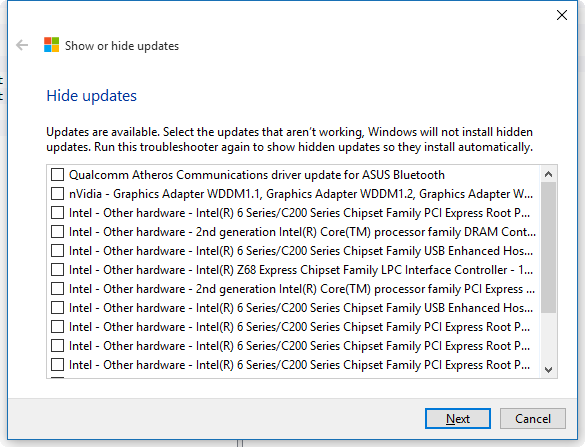 Curiously enough there are several other updates that I can also disable but even though they appear in the list of updates in the 'Show or hide updates' tool the Windows Update is claiming that there are no updates. Currently I have no idea why the rest of the update will not install. Not the answer you're looking for? Browse other questions tagged windows-10 windows-update or ask your own question. Hyperlinks in Windows Update window not working? Why is Windows Update trying to install an update I don't need?